All of the research work below has been partially funded by NSF (the US National Science Foundation) through grants REU DMS-1757872, REU DMS-1460766, CCF-1409020, MCS DMS-0915245, NSF CAREER grant DMS-0349309, DMS-0211458, CARGO DMS-0138446, and an NSF Postdoctoral Fellowship. Some of the work below has also been funded by an ASCR DOE grant DE-SC0002505, a (Swedish) Wenner-Gren Foundation Visiting Researcher Grant, and a von Neumann visiting professoship at TU Munchen. If you have trouble finding a non-downloadable paper below then please e-mail me at rojas@math.tamu.edu . You can also find abstracts (in HTML format) for the papers listed below by clicking HERE. 77. ``A Faster Solution to Smale's 17th Problem I: Real Binomial Systems,'' (Grigoris Paouris, Kaitlyn Phillipson, and J. Maurice Rojas), proceedings of ISSAC 2019 (July 15-18, 2019, Beihang University, Beijing, China), to appear. 76. ``Probabilistic Condition Number Estimates for Real Polynomial Systems II: Structure and Smoothed Analysis,'' (by Alperen A. Ergür, Grigoris Paouris, and J. Maurice Rojas), submitted for publication. 75. ``Dedekind Zeta Zeroes and Faster Complex Dimension Computation,'' (by J. Maurice Rojas and Yuyu Zhu), submitted to a conference. 74. ``New Subexponential Fewnomial Hypersurface Bounds,'' (by Jens Forsgard, Mounir Nisse, and J. Maurice Rojas), submitted for publication. 73. ``A-Discriminants for Complex Exponents and Counting Real Isotopy Types,'' (by J. Maurice Rojas and Korben Rusek), accepted for presentation at MEGA 2017 (Nice, France, June 12-16), submitted for publication, in revision. 72. ``Counting Tropically Degenerate Valuations and p-adic Approaches to the Hardness of the Permanent,'' (by Pascal Koiran, Natacha Portier, and J. Maurice Rojas), submitted for publication. Note: Thanks to Qi Cheng for pointing out that Corollary 4 on the 16th page of an earlier paper by Berthomieu, Lecerf, and Quintin proves a generalization of the main result (Theorem 1.1) from Paper #71 and gives a sharper complexity bound. Nevertheless, the underlying algorithms are approached differently, so the development of Paper #71 (the recursion tree structure, in particular) may still be of value. 69. ``Counting Roots of Polynomials Over Prime Power Rings,'' (by Qi Cheng, Shuhong Gao, J. Maurice Rojas, and Daqing Wan), proceedings of ANTS XIII (Thirteenth Algorithmic Number Theory Symposium University of Wisconsin, Madison July 16–20, 2018), Mathematical Science Publishers, Open Book Series, Vol. 2, 2019. 68. ``Probabilistic Condition Number Estimates for Real Polynomial Systems I: A Broader Family of Distributions,'' (by Alperen A. Ergür, Grigoris Paouris, and J. Maurice Rojas), Foundations of Computational Mathematics, accepted. 67. ``Metric Estimates and Membership Complexity for Archimedean Amoebae and Tropical Hypersurfaces,'' (by Martin Avendano, Roman Kogan, Mounir Nisse, and J. Maurice Rojas), presented at MEGA 2013, Journal of Complexity, Vol. 46, June 2018, pp. 45-65. 66. ``Sparse Univariate Polynomials with Many Roots Over a Finite Field,'' (by Qi Cheng, Shuhong Gao, J. Maurice Rojas, and Daqing Wan), (presented at MEGA 2015) Finite Fields and their Applications, Vol. 46, July 2017, pp. 235-246. 65. ``Sub-Linear Root Detection, and New Hardness Results, for Sparse Polynomials Over Finite Fields,'' (by Jingguo Bi, Qi Cheng, and J. Maurice Rojas), SIAM Journal on Computing, Vol. 45, No. 4 (2016), pp. 1433-1447. 64. ``About Herman Auerbach's Problem on Factors of Real Polynomials with Connected Zero Set Complement,'' (by J. Maurice Rojas), slightly longer version of commentary on Problem #148 from the Scottish Book: The Scottish Book (2nd edition, edited by R. Daniel Mauldin), pp. 239-242, Springer-Verlag, 2015. 63. ``Polynomial-time Amoeba Neighborhood Membership and Faster Localized Solving,'' (by Eleanor Anthony, Sheridan Grant, Peter Gritzmann, and J. Maurice Rojas), Chapter 15 of: Topological and Statistical Methods for Complex Data -- Tackling Large-Scale, High-Dimensional, and Multivariate Data Sets, (Bennett, Janine; Vivodtzev, Fabien; Pascucci, Valerio (Eds. )), pp. 255-278, series on Mathematics and Visualization, Springer-Verlag, 2015. 62. ``Sub-Linear Root Detection, and New Hardness Results, for Sparse Polynomials Over Finite Fields,'' (by Jingguo Bi, Qi Cheng, and J. Maurice Rojas), in proceedings of ISSAC (International Symposium on Symbolic and Algebraic Computation, June 26-29, Boston, MA), pp. 61--68, ACM Press, 2013. Winner of the 2013 ISSAC Distinguished Paper Award. 61. Book Review: Beck's Inevitable Randomness in Discrete Mathematics, Bulletin of the American Mathematical Society, Vol. 50, no. 3, July 2013, pp. 481-487. 60. ``Fewnomial Systems with Many Roots, and an Adelic Tau Conjecture,'' (by Kaitlyn Phillipson (née Hellenbrand) and J. Maurice Rojas), in proceedings of Bellairs workshop on tropical and non-Archimedean geometry (May 6-13, 2011, Barbados), Contemporary Mathematics, vol. 605, pp. 45-71, AMS Press, 2013. 59. ``Faster p-adic Feasibility for Certain Multivariate Sparse Polynomials,'', (by Martin Avendano, Ashraf Ibrahim, J. Maurice Rojas, and Korben Rusek), Journal of Symbolic Computation, special issue in honor of 60th birthday of Joachim von zur Gathen, vol. 47, no. 4, pp. 454-479 (April 2012). 58. Randomization, Relaxation, and Complexity, (edited by Leonid Gurvits, Philippe Pébay, J. Maurice Rojas, and David C. Thompson), selected papers from a 5-day BIRS workshop on Randomization, Relaxation, and Complexity (co-organized by L. Gurvits, J. Maurice Rojas, and P. Parrilo), Contemporary Mathematics, vol. 556, American Mathematical Society, 2011. 57. ``Randomization, Sums of Squares, Near-Circuits, and Faster Real Root Counting,'' (by Osbert Bastani, Chris Hillar, Dimitar Popov, and J. Maurice Rojas), in Randomization, Relaxation, and Complexity in Polynomial Equation Solving, Contemporary Mathematics, vol. 556, pp. 145-166, AMS Press, 2011. 56. ``New Multiplier Sequences via Discriminant Amoebae,'' (by Mikael Passare, J. Maurice Rojas, and Boris Shapiro), Moscow Mathematical Journal (special issue in memory of Vladimir Igorevich Arnold), vol. 11, no. 3, July-September 2011, pp. 547-560. 55. ``Optimizing n-variate (n+k)-nomials for small k,'' (by Philippe Pebay, J. Maurice Rojas, and David C. Thompson), Theoretical Computer Science, Symbolic-Numeric Computation 2009 special issue, Vol. 412, No. 16 (1 April 2011), pp. 1457-1469. 54. ``Randomized NP-Completeness for p-adic Rational Roots of Sparse Polynomials in One Variable,'' (by Martin Avendano, Ashraf Ibrahim, J. Maurice Rojas, and Korben Rusek), proceedings of ISSAC 2010 (July 25-28, 2010, Munchen), pp. 331-338, ACM Press, 2010. 53. ``Optimization and NP_R-Completeness of Certain Fewnomials,'' (by Philippe Pebay, J. Maurice Rojas, and David C. Thompson), proceedings of SNC 2009 (August 3--5, 2009, Kyoto, Japan), pp. 133-142, ACM Press, 2009. 52. ``Faster Real Feasibility via Circuit Discriminants,'' (by Frederic Bihan, J. Maurice Rojas, and Casey Stella), proceedings of ISSAC 2009 (July 28-31, Seoul, Korea), pp. 39-46, ACM Press, 2009. Matlab implementation of the main algorithm of our paper (Algorithm 3.2) can be downloaded HERE. 51. ``Refined Asymptotics for Sparse Sums of Squares (Extended Abstract),'' (by J. Maurice Rojas and Swaminathan Sethuraman), accepted for presentation at Effective Methods in Algebraic Geometry (MEGA 2009), Barcelona, June 15-19, 2009. 50. Book Review: Basu, Pollack, and Roy's Algorithms in Real Algebraic Geometry, Foundations of Computational Mathematics, Vol. 8, No. 6 (2008), pp. 765--771. 49. ``New Complexity Bounds for Certain Real Fewnomial Zero Sets (Extended Abstract),'' (by Joel Gomez, Andrew Niles, and J. Maurice Rojas), accepted for presentation at MEGA 2007, RICAM (Johann Radon Institute for Computational and Applied Mathematics), Strobl, Austria, June 24-30, 2007. 48. ``On the Sharpness of Fewnomial Bounds and the Number of Components of Fewnomial Hypersurfaces,'' (by Frederic Bihan, J. Maurice Rojas, and Frank Sottile), Algorithms in Algebraic Geometry (Alicia Dickenstein, Frank-Olaf Schreyer, and Andrew J. Sommese, eds. 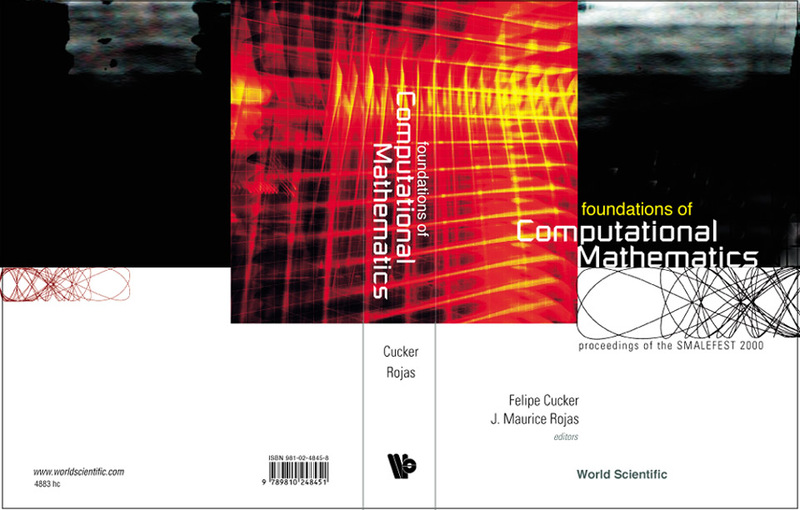 ), IMA Volumes in Mathematics and its Applications, Vol. 146, pp. 15-20, Springer-Verlag, 2007. 47. ``On Interpolating Between Quantum and Classical Complexity Classes,'' Proceedings of Mathematics of Quantum Computation and Quantum Technology (November 13-16, 2005, Texas A&M University), pp. 67-88, Taylor & Francis, 2007. 46. ``Efficiently Detecting Subtori and Torsion Points,'' proceedings of MAGIC 2005 (Midwest Algebra, Geometry, and their Interactions Conference, Oct. 7-11, 2005, Notre Dame University, Indiana), edited by A. Corso, J. Migliore, and C. Polini), pp. 213-233, Contemporary Mathematics, vol. 448, AMS Press, 2007. 45. ``Extremal Real Algebraic Geometry and A-Discriminants,'' (by Alicia Dickenstein, J. Maurice Rojas, Korben Rusek, and Justin Shih), Moscow Mathematical Journal, vol. 7, no. 3, July-September 2007, pp. 425-452. 44. ``A New Method of Motion Coordination of a Group of Mobile Robots,'' (by S. Sethuraman, M. Lal, J. Maurice Rojas, and S. Jayasuriya), ASME 2006 International Mechanical Engineering Congress and Exposition (IMECE2006, Nov. 5-10, 2006, Chicago, Illinois, USA), Dynamic Systems and Control Division, pp. 1273-1279, ASME 2006. 42. ``Practical Conversion from Torsion Space to Cartesian Space for in silico Protein Synthesis,'' (with Jerod Parsons, Brad Holmes, Jerry Tsai, and Charlie E. Strauss), Journal of Computational Chemistry, vol. 26 (July 2005), Issue 10, pp. 1063-1068. 41. ``Open Questions on Amoeba Theory and Tropical Geometry,'' expository paper for Workshop on Amoebas and Tropical Geometry, October 23-26, 2003, American Institute of Mathematics, Palo Alto, California. 40. ``An Improved Bound on the VC-Dimension of Neural Networks with Polynomial Activation Functions'' (with M. Vidyasagar), submitted for publication. 39. ``On Solving Univariate Sparse Polynomials in Logarithmic Time,'' (with Yinyu Ye), Journal of Complexity, Volume 21, Issue 1 (Foundations of Computational Mathematics Conference 2002 special issue), February 2005, pp. 87-110. 38. ``The Exact Rational Univariate Representation for Detecting Degeneracies,'' (with John Keyser and Koji Ouchi), Geometric and Algorithmic Aspects of Computer-Aided Design and Manufacturing (AMS/DIMACS Series in Discrete Mathematics and Theoretical Computer Science), edited by Ravi Janardan, Michiel Smid, and Debasis Dutta, pp. 299-328, AMS Press (2005). 37. ``High Probability Analysis of the Condition Number of Sparse Polynomial Systems'' (with Gregorio Malajovich), Theoretical Computer Science, special issue on algebraic and numerical algorithms, Vol. 315, no. 2-3, pp. 525-555 (May 6, 2004). 36. ``Attitude and Position Estimation from Vector Observations,'' (with Daniele Mortari and John L. Junkins), Proceedings of the AAS/AIAA Space Flight Mechanics Meeting (February 9-13, 2004, Maui, Hawaii), paper AAS 04-140. 35. ``Arithmetic Multivariate Descartes' Rule,'' American Journal of Mathematics, vol. 126, no. 1, February 2004, pp. 1-30. A bit of supplemental Maple code can be found HERE. 34. ``On the Determination of the Degree of an Equation Obtained by Elimination,'' (with David A. Cox), (translation of, and commentary on, a famous 1841 paper of Ferdinand Minding), Contemporary Mathematics, vol. 334, pp. 351-361, American Mathematical Society, 2003. 33. ``Why Polyhedra Matter in Non-Linear Equation Solving,'' paper corresponding to an invited talk delivered at a conference on Algebraic Geometry and Geometric Modelling (Vilnius, Lithuania, July 29-August 2, 2002), Contemporary Mathematics, vol. 334, pp. 293-320, American Mathematical Society, 2003. 32. ``Counting Real Connected Components of Trinomials Curve Intersections and m-nomial Hypersurfaces,'' (with Tien-Yien LI and Xiaoshen WANG), Discrete and Computational Geometry, 30 (2003), no. 3, pp. 379-414. 31. ``1+1=0 and Information Security'', (invited 2 page expository article for non-scientists), Advance, Texas A&M University, Office of the Vice President for Research, 2003. 30. ``Random Polynomial Systems,'' (with Gregorio Malajovich), Math ArXiV preprint math.NA/0012104. 29. ``Computing Complex Dimension Faster and Deterministically,'' Math ArXiV preprint math.AG/0005028. 28. Geometry and Topology: Seven Lectures by Raoul Bott, (notes edited by J. Maurice Rojas), Lecture Notes in Mathematics, Liu Bie Ju Centre for the Mathematical Sciences, City University of Hong Kong, to appear. 27. ``Additive Complexity and the Roots of Polynomials Over Number Fields and p-adic Fields,'' Proceedings of ANTS-V (5th Annual Algorithmic Number Theory Symposium, University of Sydney, July 7-12, 2002), Lecture Notes in Computer Science #2369, Springer-Verlag (2002), pp. 506-515. A bit of supplemental Maple code can be found HERE. 26. 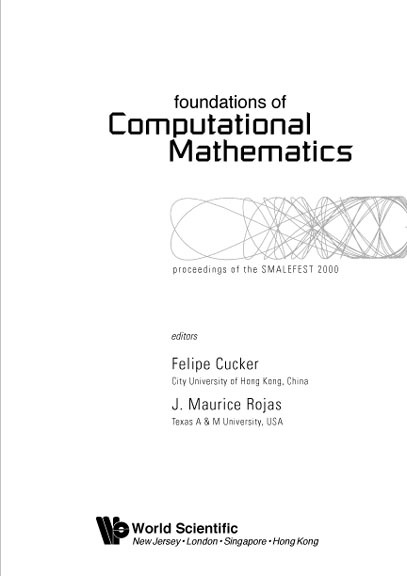 Proceedings of Smalefest 2000: Papers From an International Conference in Honor of Steve Smale's 70th Birthday (July 2000, City University of Hong Kong), edited with Felipe Cucker, World Scientific, 2002. You can view the cover, title page, foreword, and table of contents now. 25. ``Extending Triangulations and Semistable Reduction,'' (with Dan Abramovich), Proceedings of FoCM 2000, special meeting in honor of Steve Smale's 70th birthday (July 2000, City University of Hong Kong, Hong Kong), pp. 1-13, World Scientific, 2002. 24. ``Polynomial Systems and the Momentum Map,'' (with Gregorio Malajovich), Proceedings of FoCM 2000, special meeting in honor of Steve Smale's 70th birthday (July 2000, City University of Hong Kong, Hong Kong), pp. 251-266, World Scientific, 2002. 23. ``Finiteness for Arithmetic Fewnomial Systems,'' invited paper, Contemporary Mathematics, vol. 286, AMS-IMS-SIAM Joint Summer Research Conference Proceedings of ``Symbolic Computation: Solving Equations in Algebra, Geometry, and Engineering (June 11-15, 2000, Mount Holyoke College),'' edited by E. Green, S. Hosten, R. Laubenbacher and V. Powers, pp. 107-114, AMS Press, 2001. 22. ``Computational Arithmetic Geometry I: Sentences Nearly in the Polynomial Hierarchy,'' Journal of Computer and Systems Science, vol. 62, no. 2, march 2001, pp. 216-235. 21. ``Algebraic Geometry Over Four Rings and the Frontier to Tractability,'' invited paper, Contemporary Mathematics, vol. 270, Proceedings of a Conference on Hilbert's Tenth Problem and Related Subjects (University of Gent, November 1-5, 1999), edited by Jan Denef, Leonard Lipshitz, Thanases Pheidas, and Jan Van Geel, pp. 275-321, AMS Press (2000). 20. ``Some Speed-Ups and Speed Limits for Real Algebraic Geometry,'' Journal of Complexity, FoCM 1999 special issue, vol. 16, no. 3 (sept. 2000), pp. 552-571. 19. ``Uncomputably Large Integral Points on Algebraic Plane Curves?,'' Theoretical Computer Science, special issue in honor of Manuel Blum's 60th birthday, vol. 235, no. 1, March 2000, pp. 145-162. 18. ``On the Complexity of Diophantine Geometry in Low Dimensions,'' Proceedings of the 31st Annual ACM Symposium on Theory of Computing (STOC '99, May 1-4, 1999, Atlanta, Georgia), pp. 527-536, ACM Press, 1999. 17. ``Solving Degenerate Sparse Polynomial Systems Faster,'' Journal of Symbolic Computation, vol. 28 (special issue on elimination theory), no. 1/2, July and August 1999, pp. 155-186. 16. ``Toric Intersection Theory for Affine Root Counting,'' Journal of Pure and Applied Algebra , vol. 136, no.1, March, 1999, pp. 67-100. Note: Pinaki Mondal found a very nice correction to an error in the Affine Point Theorem II. (The formula from Corollary 1 in terms of stable mixed volume is correct, however.) So his paper HERE subsumes my paper. 15. ``Intrinsic Near Quadratic Complexity Bounds for Real Multivariate Root Counting,'' Proceedings of the Sixth Annual European Symposium on Algorithms, Lecture Notes on Computer Science, vol. 1461, pp. 127-138, Springer-Verlag (1998). 14. ``Affine Elimination Theory (Extended Abstract),'' Proceedings of a conference in honor of the 60th birthday of David A. Buchsbaum, Northeastern University, October, 1997. 13. ``Toric Generalized Characteristic Polynomials,'' MSRI Preprint #1997-017. 12. ``Some New Applications of Toric Geometry,'' MSRI Preprint. 11. ``A New Approach to Counting Nash Equilibria,'' Proceedings of the IEEE/IAFE Conference on Computational Intelligence for Financial Engineering, Manhattan, New York, March 23--25, 1997, pp. 130-136. 10. ``Toric Laminations, Sparse Generalized Characteristic Polynomials, and a Refinement of Hilbert's Tenth Problem,'' Foundations of Computational Mathematics, selected papers of a conference, held at IMPA in Rio de Janeiro, January 1997, Felipe Cucker and Mike Shub (eds. ), pp. 369-381, Springer-Verlag (1997). 9. ``Commutative Algebra Without Commutativity,'' sole solution to Problem 10437, American Mathematical Monthly, vol. 104, no. 7, Aug.-Sep. 1997. 8. ``Counting Affine Roots Via Pointed Newton Polytopes,'' (with Xiaoshen Wang), Journal of Complexity, vol. 12 (June 1996), pp. 116-133. Note: Pinaki Mondal found a very nice correction to an error in Theorem I. So his paper HERE subsumes my paper with Wang. 7. ``On the Average Number of Real Roots of Certain Sparse Polynomial Systems,'' Lectures in Applied Mathematics, Vol. 32 (1996), pp. 689-699, American Mathematical Society. 6. ``Extensions and Corrections for `A Convex Geometric...','' MSRI preprint. 5. Cohomology, Combinatorics, and Complexity Arising from Solving Polynomial Systems, Ph.D. thesis, UC Berkeley, 1995. 4. Problem 10437, American Mathematical Monthly, Vol. 102, #2, February 1995, page 170. 3. ``A Convex Geometric Approach to Counting the Roots of a Polynomial System,'' Theoretical Computer Science, vol. 133 (1), pp. 105-140, October, 1994. 2. ``A New Upper Bound on the Number of Roots of a Multilinear System,'' technical report, SCAMP 1992, Center for Communications Research, Princeton, New Jersey. 1. ``An Optimal Condition for Determining the Exact Number of Roots of a Polynomial System,'' (with John Canny), Proceedings of ISSAC '91 (Bonn, Germany), pp. 96-102, ACM Press, 1991. This page has been accessed at least times since the counter was last reset.